Hand crafted with the rich, abundant clay by the largest ceramic manufacturer in the Boleslawiec Region of Poland, the Boleslawiec Fermenting Crock is crafted by those with over 60 years of experience. Vegetables stored in airtight fermenting crock pots such as the ME2110LB 10 Liter Green Crock pot have proven to be one of the best possible ways to maintain the vegetables flavor and fresh aroma. Contrary to foods pasteurized in preserve jars, food items stored in stoneware containers lose none of their nutritional value. Wow! My 10 L crock arrived fast and was packaged like nothing I've ever seen! I'm very impressed. 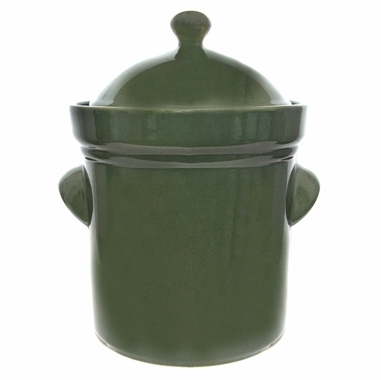 I wanted something besides the standard brown crock, and it just so happens my kitchen is green like this crock. It seems very well made. Looks a more handcrafted than the cheaper crocks. There are a few minor pinhole sized indents in the glaze, but nothing that should ever effect the quality. The delivery was time was amazing. Ordered it one day and had it the next. What, do they use drones? It was so well packed they could have safely shipped nitroglycerin in that box. I'm very happy and will recommend other people to Harvest Essentials. I was shocked how fast it arrived. I ordered it on a Monday morning and it arrived around lunchtime the next day..What, do you people use drones to deliver these things? lol...The packaging was also superb. Packed well enough that they could have sent nitroglycerin in the box, and it would have arrived safely. the pot itself..oh yeh, that...looks perfect.The green color is perfect. The glaze is almost perfect. A cpl/few very minor pin holes in the glaze when I inspected it very closely, as well as a cpl of area that seemed slightly indented only showing that it's hand made. I'm very happy with this purchase. Packaged well. Shipped and received in a timely manner. Product appeared as in the photo. I wish I could give this an excellent rating because of its great design, weight, and aesthetics. However, I was never told it may have glaze issues because they are hand crafted.this is good but let people know or weed out the more flawed ones. I wasn't prepared to have a less than perfect look which was disappointing especially for that price. Well made and great looking crock. The crock arrived in less than 3 business days and securely packaged to avoid breakage! I will definitely be purchasing another crock in the future from Harvest Essentials. very nice crock, very well packed, will be getting another. I'm very happy with my 10 liter crock. I have a 5 liter crock but really wanted to be able to make more than 4 liters of fermented vegetables at a time and this is perfect for that. The crock came very well packed and was perfect when I received it. The 10 liter crock holds about 8 liters with plenty of room for the weights and brine. 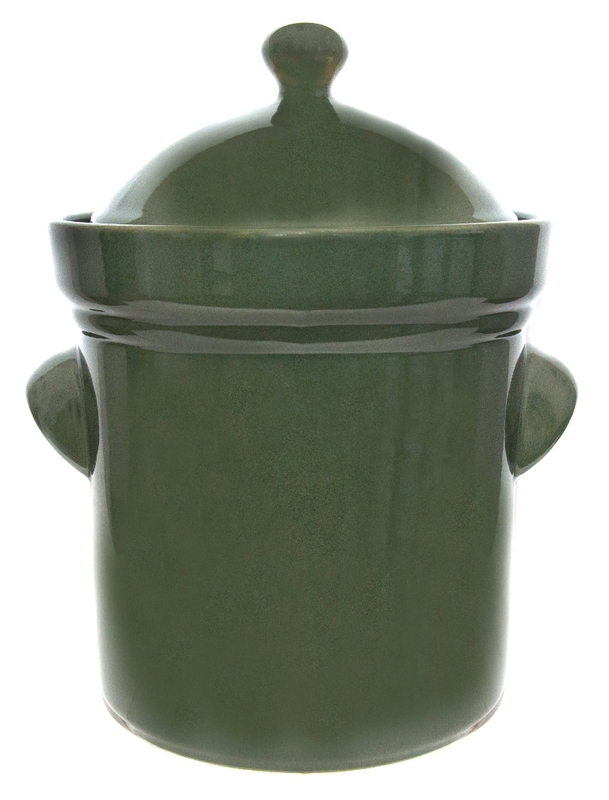 This crock is beautiful and the water seal at the top gives me confidence in the safety of my fermented products. very happy with my purchase!